With Commander Mark Kelly and Pilot Ken Ham at the controls, space shuttle Discovery descended to a smooth landing at Kennedy Space Center, Fla. The STS-124 crew concluded their successful assembly mission to the International Space Station when the shuttle landed at 11:15 a.m. EDT. 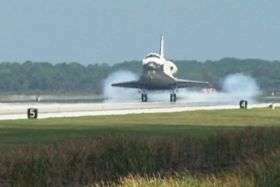 Space shuttle Discovery and its crew landed at 11:15 a.m. EDT Saturday, at NASA's Kennedy Space Center, Fla., completing a 14-day journey of more than 5.7 million miles in space. The STS-124 mission was the second of three flights to launch components to the International Space Station to complete the Japan Aerospace Exploration Agency's Kibo laboratory. Discovery delivered Kibo's tour bus-sized Japanese Pressurized Module, or JPM, which is the station's largest module. The mission included three spacewalks to install and outfit the JPM and activate its robotic arm system. The lab's logistics module, which was delivered and installed in a temporary location in March, was attached to its permanent position on top of the JPM. Mark Kelly commanded the flight and was joined by Pilot Ken Ham, Mission Specialists Karen Nyberg, Ron Garan, Mike Fossum, Greg Chamitoff, and Japan Aerospace Exploration Agency astronaut Akihiko Hoshide. Chamitoff remained aboard the space station, replacing Expedition 17 Flight Engineer Garrett Reisman, who returned to Earth on Discovery after nearly three months on the station. Chamitoff will return on shuttle Endeavour's STS-126 mission, targeted for launch November 10. STS-124 was the 123rd space shuttle flight, the 35th flight for shuttle Discovery and the 26th flight of a shuttle to the station. With Discovery and its crew safely home, the stage is set for the launch of STS-125 on October 8. Atlantis' mission will return the space shuttle to the Hubble Space Telescope for one last visit before the shuttle fleet retires in 2010. Over 12 days and five spacewalks, Atlantis' crew will make repairs and upgrades to the telescope, preparing it for at least another five years of research.